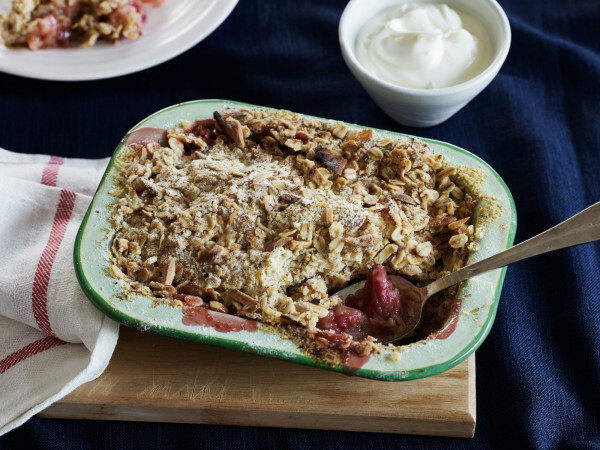 This has got to be good for you – rhubarb, apples, ginger, whole oats, almonds and coconut! Preheat oven to 180°C (350°F). Make the crumble in a dish or 2 old-fashioned lined enamel pie dishes or 6 ramekins. 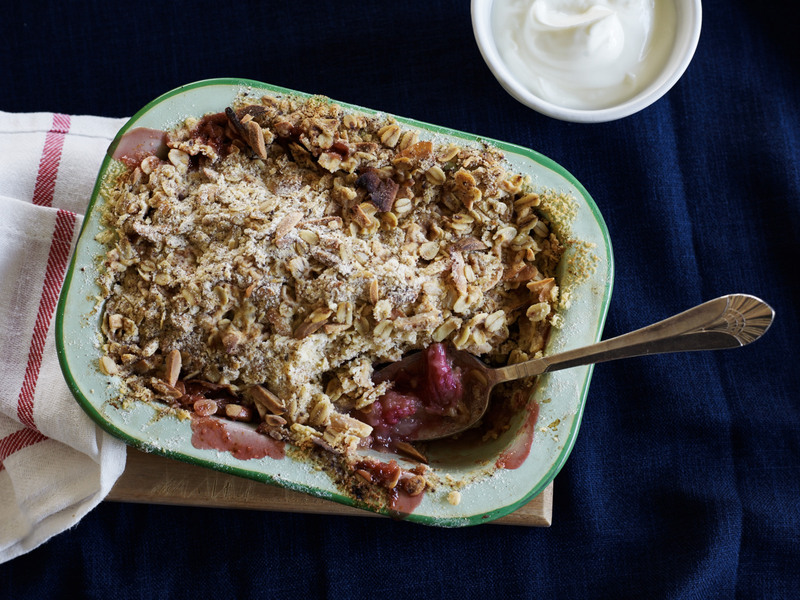 1 Put rhubarb in an ovenproof dish/dishes, sprinkle with brown sugar, add ginger and orange zest. Peel and chop apples and put them in the dish on top of rhubarb. 2 Rub butter into flour until it looks like coarse lumpy breadcrumbs. Add caster sugar, whole oats, almonds and coconut flakes. Spoon on top of fruit making sure all the fruit is covered. 3 Cook for about 30 minutes in preheated oven, until rhubarb has softened and juices have started to bubble and run and crumble has browned. If the crumble browns before fruit has softened, drape it loosely with tin foil and lower heat to 170°C (325°F). Serve hot or warm with custard, yoghurt or ice cream. 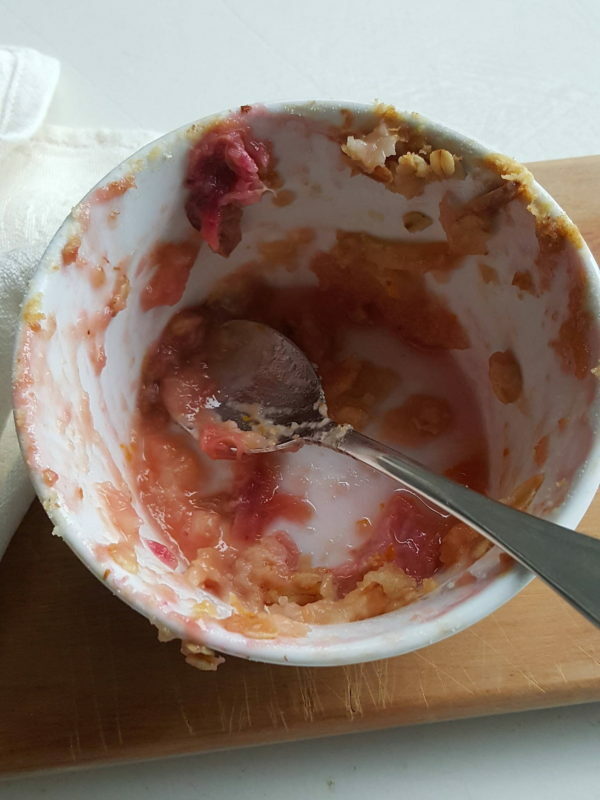 The fruit collapses and shrinks down in the dish during cooking, so pack the dishes nice and full with fruit, then mound the crumble on top. Resist the temptation to pat down the crumble too much, it stays lighter with a bit of air in it. Don’t forget to cook the crumble on a baking sheet in case of any spillages. Yep, someone ate it all up!